» San’in Trip: Day Three-Fished out! And Monsters Too! We started the day with a modest fish, soup, and rice breakfast at the dormitory with a couple of sailors, then walked to my favorite fish　market. After my previous visit to this lively market filled with unbelievable deals, I could not leave the town without stopping there again. 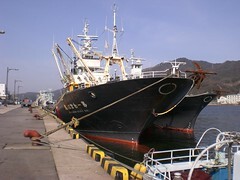 As one of the biggest fishing ports, Sakaiminato is all about fish! But, there’s one more huge attraction in town that draws people from all over the country. Mizuki Shigeru Road is named after the creator of GeGeGe no Kitaro. The street is lined up with statues of yōkai characters from the cartoon, such as the most popular Eyeball Daddy, Ratman, Catchick and many more. The day we were there was just the start of the spring break and the early morning street was already filled with kids and parents hopping from statue to statue to rub their palm up and down on these wild figures and take pictures with them as if they are just waiting for the monsters to come alive. At the end of the street filled with spirits and monsters, close by the JR station, is the home of Chiyomusubi Shuzo, the magnet that brought us to Sakaiminato. At the brewery, Iwanari Toji kindly took some time out of his busy schedule and showed us around. 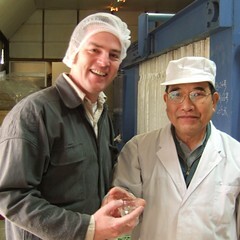 A third generation toji, his very gentle and warm personality is what you taste in their brew. I thought how soft and comfortable, but at the same time, firm and passionate. You might pass by this tiny eatery without noticing if you weren’t in the know. They buy only locally caught fish of quality that the chef approves, so the menu is truly the catch of the day. Then, a set amount of rice is prepared for lunch. Sushi at Iroha is excellent, fresh, and very filling, but I imagine that’s just a part of the attraction. When the young sushi chef behind the counter starts to talk about local fish, he beams with enthusiasm and becomes unstoppable. Rather than changing his philosophy to expand his business and serve more customer, he said he chooses to stay within his means and serve only good local seafood and only the limited amount he can handle at one time without sacrificing any quality. I do not know if this gives you any idea, but consider that they close at 7 pm for dinner. Yes, 7 pm! 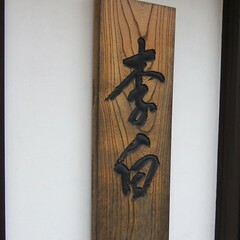 After becoming totally content at Iroha Sushi, as designated driver for the day I drove us to Matsue to visit Rihaku Shuzo, well-known for their Wondering Poet brand of sake. After we met the newest generation at the brewery, Tanaka-san at our sensei‘s lecture and were impressed with their brew, I thought I definitely had to visit. 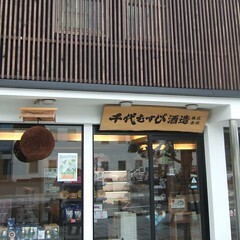 Plus, our friend and favorite cheese specialist had named Rihaku the best match with cheese. “Our brew has this view”, Tanaka-san first took us to the top of multi story facility and opened the big windows revealing the stunning view of Matsue Castle and the very green and beautiful water city without anything blocking the view. But then, I also spotted a little shinto alter above the tanks. There are so many philosophies and approaches to sake brewing, but the altar is one thing every brewer shares. So, naturally, I asked Tanaka-san if their tablets in the altar are from Matsuo Shrine in Kyoto. “No, actually, we have our local shrine dedicated to the sake god, Saka Shrine, just half way between Izumo and Matsue.” The name of the shrine appears in Izumo Fudoki, records and legends of the area written in the 8th century, as the place where the gods had a big sake party that lasted 180 days. Legend has it that Izumo area in Shimane is the oldest sake brewing district and people still feel that connection. 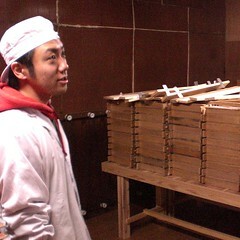 Tanaka-san spent a good amount of time explaining about the Saka Shrine and its history. What I was touched by most was he really, really wanted to bring the old tradition back into the spotlight. 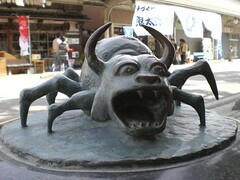 He wanted to promote the quiet ancient sake god in Izumo that deserves recognition. After a farewell, we enjoyed the city on our walk back to the hotel along the castle moat and canals. That night, we resorted to a plain okonomiyaki dinner since to our own surprise we declared total defeat by fish. After two days with three fish centric meals a day, we both finally said, “I am fished out for now.” Actually, Matsue is perfect for both enjoying savory regional cuisine or other types of comfort foods you find in bigger cities. Please visit Tokyofoodcast’s San’in Trip: Day One and Day Two–Follow the crab. For locations of the restaurants and breweries in the post, please visit Tokyofoodcast’s San’in Trip Series post. My definition of happiness is spending time with friends and family with ood sushi and warm sake.